Eighteen Potato Mashers, 1972. Collage: 14-1/2 x 14-1/2. Piero Grunstein, Milan. Jacqueline Kennedy Onassis' Mother's Potato Masher, 1972. Collage: 14-1/2 x 14-1/2. Maria Teresa Incisetto Collection, Naples. Marilyn Monroe, 1972. Collage: 14-1/2 x 14-1/2. Piero Grunstein, Milan. 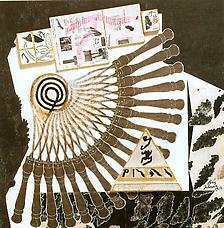 The Schwarz Gallery is presenting the first European one-man show of collages by Ray Johnson. Writing about these works, reviewers often comment that Ray Johnson is more famous for his continuing mailing activity called the New York Correspondance School; writing about the Correspondance School they say the reverse . . . The two activities, however, are not without similarities. The twenty-four collages in this show, for example, have been conceived not only as individual entities but also as parts of a continuing situation that constantly comments upon itself, and in some cases two separate works can even be taken for complementary halves of a larger work. Each individual work is both complete and incomplete. The same is true for many messages that travel in the Correspondance School. Excerpt from Art International, Summer 1972.